Signs By Van is located in beautiful Salinas, California which is a suburban area located just south of the Greater Bay Area and home to over two dozen wineries. If you find yourself traveling to, through, or around the surrounding area of Salinas, and are a self-proclaimed wino, then you’ll want to continue reading this article. Hahn’s vineyards and wineries share the same home as Signs By Van in Monterey County. The Hahn family has been sharing their wines with the world since the 1980s, and are known for their array of classically-styled wines. Hahn offers Pinot Noir, Chardonnay, Pinot Gris, Cabernet Sauvignon, GSM, and Merlot that are all intelligently balanced with very specific fruit-forward notes. Of course it would be tough to mention and urge you to taste their famous wine if they didn’t have tasting rooms or tours. The Hahn tasting room is nestled in Soledad, CA and is open year round. If you want the full experience, we recommend scheduling a tour for your group. 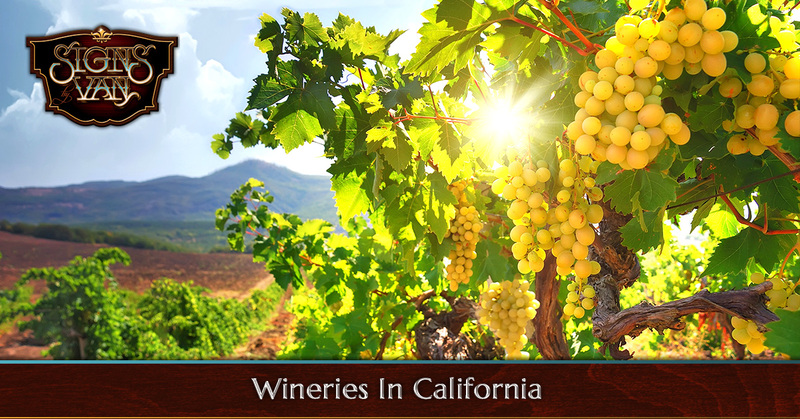 They offer a variety of tastings and tours that is sure to appeal to any wino! Feeling adventurous? Hahn Estates offers an ATV tour of their estate to take in the scenery and get the most out of their vineyards. They’re located at 3700 Foothill Road in Soledad. Be sure to take notice of the custom winery signage throughout their estate while you pay them a visit. Another vineyard gem that is tucked in Soledad, is the beautiful Paraiso Vineyards and another one of our favorites that is definitely worth visiting. Creating custom signage for Paraiso Vineyards was a real honor. Paraiso is apart of the Smith Family Wines and is owned and operated by a multi-generation family whom grew their vineyards from humble beginnings. The Smith family consists of hardworking, determined, artisan winemakers that have honed their craft to create the amazing place it is today. You’ll immediately feel welcome as soon as you enter their property, and you’ll hate to leave their immaculate hillside views and their comfortable homestyle tasting room. So as you travel through the area, and you’re looking for a calm place to sip on estate-grown wines, stop by the Paraiso Vineyards at Smith Family Wines. What we love about the vineyards in the area, is the homegrown, family-focused, and passionate people that are behind winemaking. Six Hands Winery is no different. Although this winery is smaller than others in the area, they manage to produce eleven grape varietals and intervening as little as possible. The winemakers pay close attention to their grapes to ensure the highest standards. Six Hands Winery began as a hobby and quickly escalated to what we know it as today. With a rich family history, the six individuals who have remained true to their roots are committed to sustainable farming and producing hand-crafted wines for many years to come. As sign makers in Monterey County, we can proudly say that our jobs are pretty awesome. Not many professions get to contribute to another business’ brand and overall success. The first thing people notice as they are driving passed these renowned wineries, are our custom signage our professional sign makers built to be displayed. Signs By Van contributes to other businesses through California. We craft and build wooden signs and 3D dimensional signage for restaurants, municipal buildings, local businesses, hotels and motels, even wedding decor. If you need a custom sign built—for anything—call Signs By Van. Be sure to visit our site and preview our portfolio to see our previous projects and all of the winery signs we’ve built.